The rock press went nuts for Bonham in ’89. Finally, after long wait, the son of legendary Led Zeppelin drummer John Bonham finally made his move into the music world. Fans had seen him in The Song Remains the Same. Some knew that Jason Bonham jammed with Zeppelin in 1988 at Atlantic’s 40th anniversary bash. It was a much more successful reunion than 1985’s Live Aid. The music world in 1989 was far removed from the days of Zeppelin. Pretty boys with big hair and flashy videos were the norm. Bands who could get up there and jam for 20 minutes or more on a single track were few. With much naiveté, the magazines drooled over Jason Bonham’s new band, simply and obviously called Bonham. The singer, a young Canadian named Daniel MacMaster, had the youthful curls and range of a young Robert Plant. The bassist, John Smithson, was a talented multi-instrumentalist just like John Paul Jones. The band had to be a quartet; there could be no other way. They tapped Bob Ezrin to produce, a guy who has never done anything that sounded like Led Zeppelin, but someone who was able to take young bands and push them ahead a few levels. The resultant album The Disregard of Timekeeping attained a lot of attention, making many magazines’ year end lists. Best new group, best new album, etc. etc. And while it is an ambitious record for a debut, it does fall very short of those lofty marks. Going for the bombastic, the CD opens with a two minute instrumental of keyboards, guitars, violins and the odd burst of drums. It makes little impact besides setting up the first single “Wait For You”. Conceptually, it sounds as if they collectively said, “Right, so let’s write a song that sounds like something that could have been on the next Zeppelin album after In Through the Out Door.” So it’s big, echoey and loaded with keyboards and effects. It does recall Zeppelin, particular the remarkable pipes of MacMaster. It has the necessary big chorus that you needed to have in 1989, and the two sides of rock that Bonham inhabited were melded together in fine fashion. “Wait For You” is a success, but Ezrin’s production in the late 80’s seemed hollow. Is the Bonham DNA present? Yes, of course. It comes out most naturally via the drum parts, but a lot of the material sounds intentionally contrived. Still, there were a number of really good tracks on the album, enough to make it worth buying. Young Jason, sounding exactly like his dad, counts in the quality track “Guilty” with a “One, two, ha ha ha!” It sounds less like Led Zeppelin, and more like late-80’s Deep Purple. Which is fine of course; we’re talking about quality comparisons. Especially great though is John Smithson’s violin solo. I’m especially fond of the violin in rock music. I like out of the box thinking, and it’s this kind of experimentation that made Bonham more like Zeppelin in the long run. Smithson nails it with the perfect tone. Another pretty decent tune is “Holding on Forever” which has a Zep funk, with a modern 80’s chorus. “Dreams” though is nearly tanked by a long intro, featuring a guy coming home, brushing his teeth, setting his alarm and going to bed. Yes, that is correct. You have to listen to a guy coming home, brushing his teeth, and going to bed. You gotta blame Bob Ezrin for that mistake. Who wants to buy a rock album and sit through a guy brushing his teeth…only to get a ballad out of it? At least “Dreams” is a decent, progressive sounding ballad, but in the CD/mp3 age, how many people are gonna hit “skip” before the actual song, while the guy hasn’t finished brushing his teeth? Having unloaded their best songs on side one, the second side is a bit of a chore to complete. Songwriting was not the band’s strongest suit. The two best songs (“Wait For You” and “Guilty”) were co-written by Bob Ezrin, and I don’t think that’s insignificant. Other songs on the album, such as “Playing To Win”, “Cross Me and See”, and “Just Another Day”, are competent. What they lack is the magical ingredient that makes a song stay with you forever. Bonham embraced the past and present, modern production and old-fashioned playing, but that alone was not enough to forge a truly great album. Finally the album left one of the most impressive songs for the end, “Room For Us All”, an ambitious track over seven minutes long. Soft and anthemic, “Room For Us All” has subtlety that is missing elsewhere on the album. It’s an impressive end…but too little, too late. Remember this coming out… still have never heard it! Always loved the album title though. Yeah and a few people mentioned they liked the artwork. I do too. Man Jason looks like a kid. I have this on vinyl. I haven’t listened to in years. I might have to give it a spin. Daniel Macmaster (R.I.P) passed away up in Thunder Bay. I wonder if Deke knew of him. Unfortunately neither the ilike or musicmayhem pages work any longer. No, i had no idea he was living here until he passed on. Totally forgot about that. Damn. No worries Mikey….I have this one loaded up on my ipod…. I totally forgot he had passed on. Damn. Shame that he had to earn a living as a long haul truck driving. Being up in Thunder Bay, I bet he hauled steel for one of our jobs in the past. These Guys got a lot of hype back in 89 along with press coverage! Plus they opened for the Cult on the Sonic Temple tour! This album which I bought reminded me more of Foreigner than Zep .. Unfortunately McMaster passed away here in Tbay back in 2008…. violin solo, nice. brushing teeth performance, maybe less so. I’m not familiar with this one Mike, like the others, I fully approve of the title! Yeah it was a pretty good title. Much like a Floyd title actually! But I don’t know if Floyd ever put toothbrushing on an album. It probably wouldn’t have been too far out of place if they did! Good one man. It’s important to check your balls. I love the artwork! I’d buy this for that alone. Never heard this and was all enthused about adding it to the list for checking out, but the more I read the more I thought “this one ain’t for me”. I know eh? I wanted to like this so bad. Maybe I expected too much. The production was a turn off. I had forgotten Ezrin did this, but his work in the 80’s wasn’t always good. In general. Van Halen’s 1984 sounds incredible…Back in Black too…but the majority of those 80’s records really succumb to trends and transistors. Aye, there are exceptions, but there are a lot of albums that were ruined by the dated production fads of the 80’s. Fads indeed! And some of the worst sounding drums you’ll ever hear. Aw man. No kidding. Every single drum track in the 80’s was recorded in a swimming pool! Yeah! A FULL swimming pool! I am disturbed by the photo of the guy behind the bar staring at the crotch of the guy floating in the air to shoot pool. 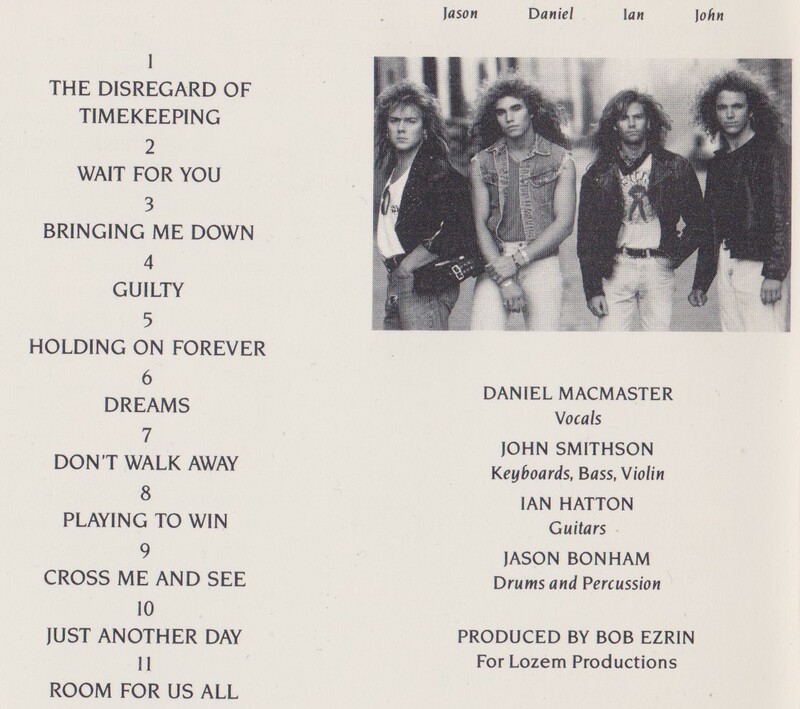 Also, it seems weird that the son of John Bonham would title an album the disregard of timekeeping. Oh my God, that MSG video was such a treat. Thanks for that. Man I must have played this album a million times back in the day. I thought it was amazing. I picked it up again just recently after having forgot about it for a helluva long time. I still dig it. It leaves quite a lot to be desired production wise but I think the songs holds up very well. Great review. Really cool to see that the album isn’t forgotten by everyone. P.S. Doesn’t Daniel McMaster look like Joey Tempest’s little brother or something like that. D.S. Maybe he IS Joey Tempest. One of them, anyway. So your parents have a pool table and a bar in their basement. Cool.